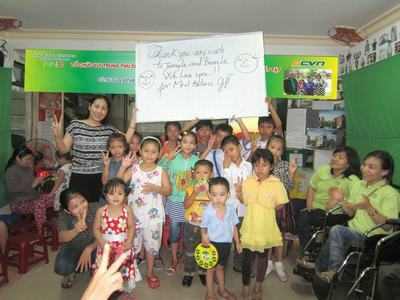 • The Nguyen Nga Center strives to develop and maintain support activities for People with Special Needs with documented hardships. To cover the expenses of all running operations we need the assistance of concerned organizations from Viet Nam and abroad, individual supporters along with contributions from involved families and the founder herself. Another important source of income is the centers effort to boost the sale of products made by the people with disabilities at the Center. • When the fundraising activities and financial support from other organizations becomes irregular, some operations at the center are curtailed until enough funds are available. • After the transfer of Phase 1 (Children’s Education) in July 2008 to the government, NNC had to move to another location and started to develop Phase 2 (Post-Education and Training). -Social Work directly at the Center and Social Outreach in the Community, each maintain independent financing. - Expenditures for the boarding of students, literacy, health insurance, first aid and every 6 months. - Investment in equipment, machinery and tools used for handicraft production. The sale of products made at the Center covers much of the expenses, but it is not enough. NNC compensates with a portion of support, for example, some of the rent. - Support for mobility, transport vehicles: bicycles, wheelchairs etc. - Support for health care and public health: medical emergencies, family-visits to the hospital after a surgery or accident, first aid medication every 6 months for the center, and health insurance.